Marissa Farrar: The Day the Sun Stopped Shining! Win $10 Amazon Gift Voucher and More!!! The Day the Sun Stopped Shining! Win $10 Amazon Gift Voucher and More!!! Today is the start of the second blog hop I'm participating in over the holidays! I love post-apocalyptic books and movies. I have a novella length story published in '2012: The Aftermath' from Pill Hill Press. I've got my rights back to that story now and have considered releasing it as a single, but I really love the premise and characters behind the story and think it would make a great full length novel, so for the moment I am sitting on it! For my giveaway on the tour, I'm going to give away a whole heap of eBooks and a $10 Amazon gift voucher! I'm going to choose three winners--the first will win a $10 gift voucher and one of my books (your choice!). The second winner will win two of my books (your choice!) and the third will win one of my books (again - in case you didn't get the idea, which book will be of your choice). One entry will be to leave me a comment, you can buy yourself a further entry by liking my facebook page, and another entry by tweeting about the contest. Please include @MarissaFarrar so I know that you've tweeted! So, you can earn yourself three entries in total. Please let me know below how many and which ones you have done (and yes that does count as a comment!). I'll be randomly drawing the winners the day after the final day of the blog hop, which will be New Years Day! Happy hopping everyone and good luck! INVITE YOUR FRIENDS AND SPREAD THE WORD! MEET AND MINGLE WITH THE AUTHORS! EXPERIENCE A NEW DESTINATION AT EVERY STOP! PARTICIPATE IN EVERY SITE'S CONTEST AND BE ENTERED FOR CHANCES TO WIN MULTIPLE PRIZES! EVERY BLOG VISITED IS ANOTHER OPPORTUNITY TO WIN! 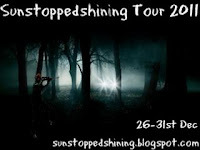 To stop by the other author blogs taking part, please stop by the homepage for a list of links! Good for you - buying the novella back and holding onto it; sounds like it has a destiny to fulfill :) Happy DTSSS Tour! Thanks Shelley, luckily I didn't have to buy it back! I only signed rights for a year, so while they've still got rights to continue to publish the story, I can also work with it. Thanks for stopping by! ...and comment makes three! Thanks for this great giveaway and the chance to get to know you better. Thanks Ash! Following you back on twitter too! Your three entries have been counted! Tweeted the link to the contest. Hello Marissa! Nice to see you again during the Day the Sun Stopped Shining Tour! Am tweeting about your contest now! Hope your Christmas was wonderful! I would love to read your books.Thanks for the giveaway & Happy Holidays. I also liked your FB page and tweeted about this giveaway. Thanks so much for tweets everyone! I've been re-following and RTing as I go. For those of you I've 'hopped' with before, 'hello again'. For those I haven't, great to meet you all! Thanks for all the entries everyone! Only a couple more days left now so get in while you still can!!! Happy hopping, Marissa! You are a busy lady! Much joy in the coming year! Day 2 of Creepfest! Meet author, Ruth Barrett! 12 Days of Creepfest! Come join the fun!